Thank you for all that you made possible in 2016! 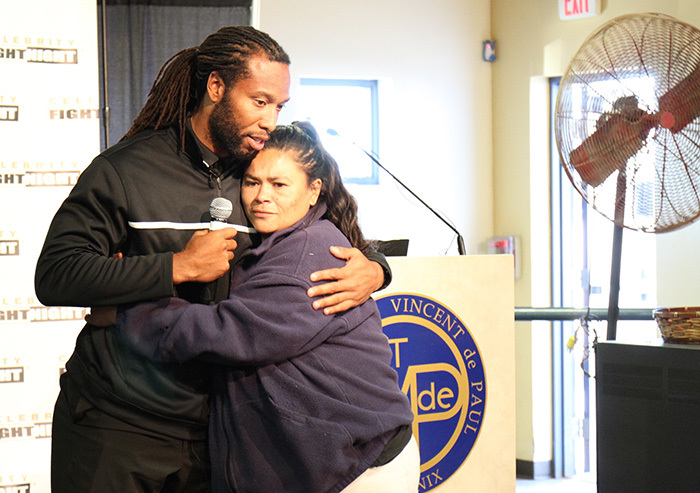 In April, Larry Fitzgerald from the Arizona Cardinals visited our downtown Phoenix dining room to share some encouraging words with our guests. His visit was part of our weekly Monday Morning Never Give Up program, created by volunteer Jimmy Walker of Celebrity Fight Night. Larry talked about the challenges he has overcome in his life, answered questions from guests, handed out raffle prizes and signed autographs. Larry also made a special visit to our Family Dining Room on Thanksgiving Day and spent time playing chess with the children in our Dream Center. We have been truly blessed to have him as a visitor and supporter. 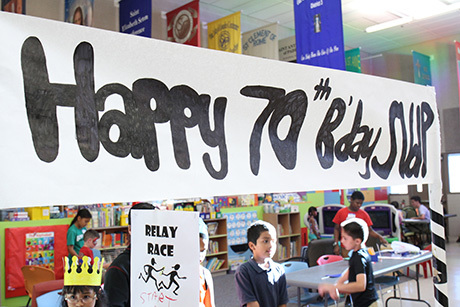 This year, we celebrated our 70th Anniversary! On April 26, 1946, a group of young men in Phoenix gathered in St. Mary’s Church, planting the seed that has now become the present-day SVdP. From the humble beginnings of one volunteer-run food pantry, we have seen tremendous growth, including a medical clinic, dental clinic, outreach to the homeless, Ozanam Manor (a transitional housing shelter), 5 dining rooms, 17 thrift stores and 83 volunteer-run food pantries that also help people with rent and utility payments. Join us in looking back through the years here. For many years, Theresa struggled with a drug addiction, ultimately losing her home, children and everything she owned. Because of this, she bounced around from staying on friends' couches, to checking into a shelter and at worst times, living on the street. While homeless, Theresa slept on a piece of cardboard every night across the street from SVdP's downtown dining room. And every day she went inside for breakfast and lunch. Eventually she decided she wanted to give back and started volunteering in the dining room. She fell in love with the work, and for the first time in years, felt empowered and hope for her future. 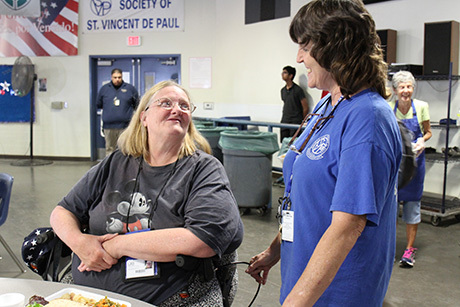 This year, she applied for a job in the dining room and is currently an SVdP dining room coordinator, encouraging the volunteers and others like her. Read her inspiring story here. Early this summer, Phoenix experienced some unexpected extreme temperatures as high as 117 degrees, and nighttime temps over 90 degrees. Because of these dangerously high temps, we held an urgent meeting with our dining room staff and decided to welcome all who needed shelter throughout the extreme heat weekend. We asked for help from the community and with your support, we were able to stay open following our normal lunch service, so that guests could enjoy cold water, fresh fruit and air conditioning. Our guests were so thankful for a respite from the brutal summer heat. 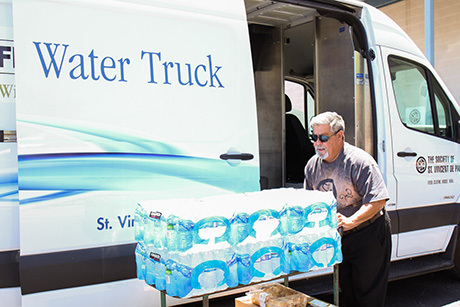 Learn about SVdP’s Celebrity Fight Night Water Truck, which also provided crucial heat and water relief. On July 4 this year, a fire broke out at our Mesa Dining Room, severely damaging the building. Even though it was a holiday, staff and volunteers worked together to ensure that those who counted on us for a meal would not go hungry. Upon learning the news, the City of Mesa, neighbors and community partners quickly offered their support. Paz de Cristo Community Center offered to host our lunch service while we repaired our dining room. 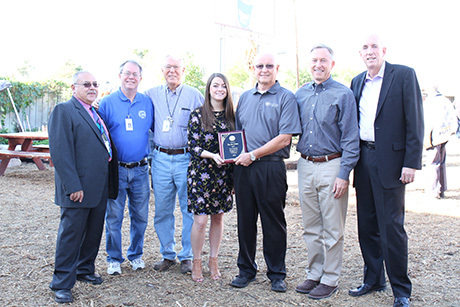 Just days before Thanksgiving, we celebrated the reopening of the dining room and were honored to have Mesa Mayor John Giles in attendance to commemorate the event. Because of the incredible support from the community, not one meal service was missed since the morning of the fire! It was our kindest, most generous Christmas season yet at St. Vincent de Paul. Blessed Sacrament Church collected and distributed 1,600 Christmas presents to families in need during our Family Evening Meal holiday party. 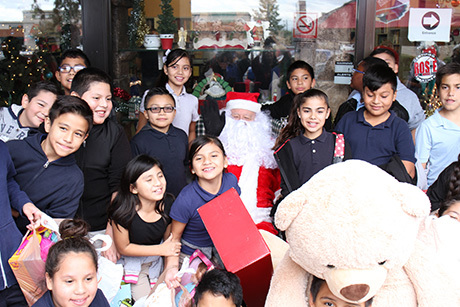 Nearly 1,400 children from Palomino Elementary enjoyed a day of shopping in our annual Palomino Christmas Event at the Bell Road Thrift Store. Mike Parker and his team from Next Phase Enterprises joined with Sharman Hickman and her team from Hickman Family Farms to provide wonderful omelette dinners, new backpacks and school supplies and a night full of fun for our families in our Family Dining Room. Raising Cane’s Chicken Fingers also came to spread some holiday cheer with Baylor University Motel Cactus Bowl football players. Several volunteers participated in a Santa’s Workshop event wrapping presents, sorting food and decorating food boxes. On Christmas day, we were blessed to have several special guests visit our dining rooms, such as Nick Lowery’s Champions for the Homeless, Arizona Cardinals’ David Johnson, Bobby Freeman (Arizona Diamondbacks organist), members from Seventh Day Adventist church and many more. It was a very blessed and joy-filled holiday season.